Natural gas is the world’s cleanest fossil fuel; it generates less air pollution and releases less CO2 per unit of useful energy than liquid fuels or coals. With its vast supplies of conventional resources and nonconventional stores, the extension of long-distance gas pipelines and the recent expansion of liquefied natural gas trade, a truly global market has been created for this clean fuel. Natural Gas: Fuel for the 21st Century discusses the place and prospects of natural gas in modern high-energy societies. Vaclav Smil presents a systematic survey of the qualities, origins, extraction, processing and transportation of natural gas, followed by a detailed appraisal of its many preferred, traditional and potential uses, and the recent emergence of the fuel as a globally traded commodity. The unfolding diversification of sources, particularly hydraulic fracturing, and the role of natural gas in national and global energy transitions are described. 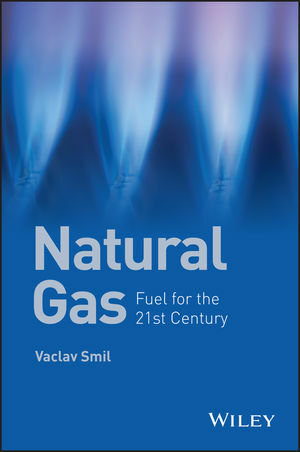 The book concludes with a discussion on the advantages, risks, benefits and costs of natural gas as a leading, if not dominant, fuel of the 21st century. This interdisciplinary text will be of interest to a wide readership concerned with global energy affairs including professionals and academics in energy and environmental science, policy makers, consultants and advisors with an interest in the rapidly-changing global energy industry. Vaclav Smil is Distinguished Professor Emeritus at the University of Manitoba in Winnipeg Canada. He is a Fellow of the Royal Society of Canada (Science Academy), Member of the Order of Canada, the author of 36 books (mostly on many aspects of energy, environment and technical innovation) and more than 400 papers. His interdisciplinary research interests span the fields of energy, environmental and population change, food production and nutrition, technical innovation, risk assessment, and public policy. Professor Smil is the first non-American to receive the American Association for the Advancement of Science Award for Public Understanding of Science and Technology, and in 2010 he was named one of Top 100 Global Thinkers by Foreign Policy. He is listed in American Men & Women of Science, Canadian Who's Who, Contemporary Authors, Men of Achievement and World Who's Who in Environment & Conservation. He has been an invited speaker at nearly 400 conferences and workshops in the USA, Canada, Europe, Asia and Africa and has given invited lectures at numerous universities in North America, Europe and East Asia.? Professor Smil has also given briefings and testimonies at the White House, the U.S. House of Representatives, Office of the Technology Assessment of the US Congress, the U.S. State Department, and Canadian Department of Foreign Affairs.